Rep. Rob Kauffman presented a citation to the 2013 Shippensburg University Field Hockey Team in the chamber of the state House of Representatives in recognition of winning the National Division II NCAA Field Hockey Championship for the first time in the school’s history. Pictured, from left, are Speaker of the House Sam Smith; Head Coach Bertie Landes; Lauren Taylor; Brynn Seidenstricker; Katie Shoop; Brittany Jett; Dr. Jody Harpster, interim president of Shippensburg University; and Kauffman. HARRISBURG – In recognition of winning the National Division II NCAA Field Hockey Championship, Rep. Rob Kauffman (R-Cumberland/Franklin) recognized the 2013 Shippensburg University Field Hockey Team with the presentation of a House citation during session in the chamber of the state House of Representatives. The Raiders won the 2013 NCAA Division II National Championship with a 2-1 overtime win over the Long Island University, Post Campus, last November. The team also had a perfect 17-0 season record and was led by three All-Americans and eight All-Conference players. 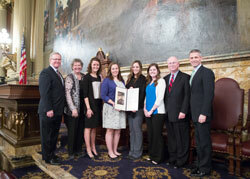 Joining Kauffman in the House chamber for the presentation of a citation were Dr. Jody Harpser, interim president of Shippensburg University; Bertie Landes, head coach; Amanda Strous, assistant coach; Jeff Michaels, athletic director; and team members Katie Shoop, Brittany Jett, Brynn Seidenstricker, Lauren Taylor, Alysha Bohn, Taylor Fisher, Lucy Kauffman, Miranda Wallace and Taylor Webster.